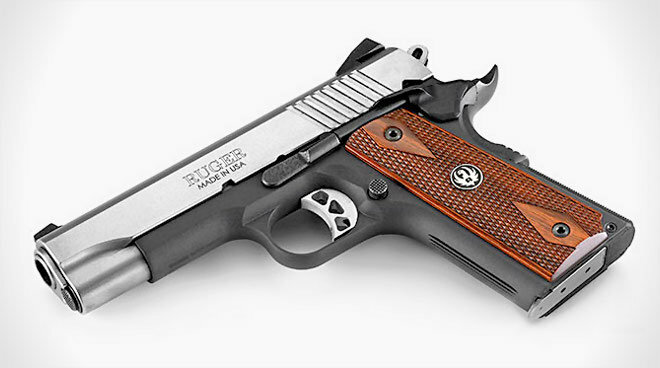 Sturm, Ruger and Company has added a new SR1911 to its catalog, an attractive two-tone Commander-sized Series 70 pistol with a lightweight alloy frame for concealed-carry. The pistol is based on the successful 1911 design and sports the same stainless steel slide and barrel as Ruger’s other 1911s but with a matte black hard-anodized frame to reduce the gun’s overall weight. Each frame is CNC machined and built with a polished titanium feed ramp for extreme longevity and the barrel and bushing are machined from bar stock — Ruger wants its alloy-framed pistol to last generations. The frame material makes a big difference in weight, cutting just over 7 ounces off the unloaded weight of the pistol compared to the steel-framed Commander-sized SR1911, bringing the final dry weight down to 29.3 ounces. That’s light enough to carry comfortably while still providing enough mass to shoot comfortably. It is a 1911, after all, chambered for the venerable .45 ACP cartridge. The pistol has a standard Commander 7+1-round capacity and 4.25-inch barrel. The new lightweight SR1911 sports all of the features people have come to expect on a modern 1911 and then some, including a skeletonized alloy trigger and competition hammer. The trigger has an adjustable overtravel stop and the slide uses a lightweight titanium inertia firing pin that makes it drop-safe. It also has an extended manual thumb safety and checkered slide stop lever. The ejection port is lowered and flared for increased reliability and features a chamber port to let the user visually confirm whether or not the pistol is loaded. Riding the top of the slide are a set of high-visibility Novak 3-dot sights. Ruger selected a flat mainspring housing for the gun and the frame and mainspring housing are grooved and checkered for a solid grip. The pistol has a high beavertail grip safety with an oversized memory button to encourage a high grip and an extended magazine release for ease of use. Because this model is destined for concealed-carry Ruger selected thin grips that bring the overall width of the gun down to 1.34 inches wide. Even though the gun has a lot of tweaks and extras, like other SR1911 pistols, it is designed to work with standard aftermarket parts and accessories including holsters. This new model is slightly more expensive than steel-framed SR1911 pistols with an MSRP set at $899, so $50 more than previous guns. Alloy-framed 1911s are often much more expensive making the new lightweight Commander-sized SR1911 a real bargain. Real-world prices for steel SR1911 pistols are in the $700 range and we expect the alloy model to keep that $50 price premium. That includes a soft case, two magazines and a barrel bushing wrench. This is just one of the many new products Ruger’s planning to launch for 2015 and we can’t wait to see what else they have up their sleeve.